This page is about the city in England. For the city in the US, see Worcester, Massachusetts. For other uses, see Worcester (disambiguation). 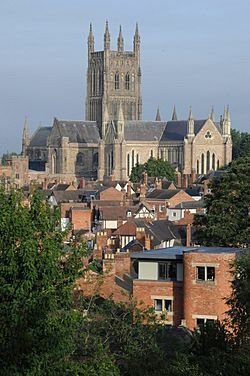 Worcester ( i/ˈwʊstər/ WUUS-tər) is a city in Worcestershire, England, 31 miles (50 km) southwest of Birmingham and 27 miles (43 km) north of Gloucester. The population is approximately 100,000. 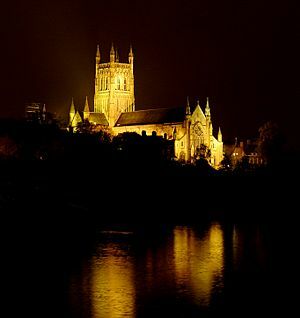 The River Severn flanks the western side of the city centre, which is overlooked by the 12th-century Worcester Cathedral. The trade route past Worcester which later formed part of the Roman Ryknild Street dates to Neolithic times. The position commanded a ford over the River Severn (the river was tidal past Worcester prior to public works projects in the 1840s) and was fortified by the Britons around 400 BC. It would have been on the northern border of the Dobunni and probably subject to the larger communities of the Malvern hillforts. The Roman settlement at the site passes unmentioned by Ptolemy's Geography, the Antonine Itinerary and the Register of Dignitaries but would have grown up on the road opened between Glevum (Gloucester) and Viroconium (Wroxeter) in the AD 40s and 50s. It may have been the "Vertis" mentioned in the 7th-century Ravenna Cosmography. Using charcoal from the Forest of Dean, the Romans operated pottery kilns and ironworks at the site and may have built a small fort. In the 3rd century, Roman Worcester occupied a larger area than the subsequent medieval city, but silting of the Diglis Basin caused the abandonment of Sidbury. Industrial production ceased and the settlement contracted to a defended position along the lines of the old British fort at the river terrace's southern end. This settlement is generally identified with the Cair Guiragon listed among the 28 cities of Britain by the History of the Britons attributed to Nennius. This is not a British name but an adaption of its Old English name Weorgoran ceaster, "fort of the Weorgoran". The Weorgoran (the "people of the winding river") were precursors of Hwicce and probably West Saxons who entered the area some time after the 577 Battle of Dyrham. In 680, their fort at Worcester was chosen—in preference to both the much larger Gloucester and the royal court at Winchcombe—to be the seat of a new bishopric, suggesting there was already a well-established and powerful Christian community when the site fell into English hands. The oldest known church was St Helen's, which was certainly British; the Saxon cathedral was dedicated to St Peter. Worcester was the site of the Battle of Worcester (3 September 1651), when Charles II attempted to forcefully regain the crown, in the fields a little to the west and south of the city, near the village of Powick. However, Charles II was defeated and returned to his headquarters in what is now known as King Charles house in the Cornmarket, before fleeing in disguise to Boscobel House in Shropshire from where he eventually escaped to France. Worcester had supported the Parliamentary cause before the outbreak of war in 1642 but spent most of the war under Royalist occupation. After the war it cleverly used its location as the site of the final battles of the First Civil War (1646) and Third Civil War (1651) to try to mount an appeal for compensation from the new King Charles II. 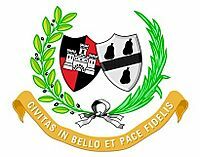 As part of this and not based upon any historical fact, it invented the epithet "Fidelis Civitas" (The Faithful City) and this motto has since been incorporated into the city's coat of arms. In 1670, the River Severn broke its banks and the subsequent flood was the worst ever seen by Worcester. A brass plate can be found on a wall on the path to the cathedral by the path along the river showing how high this flood went and other flood heights of more recent times are also shown in stone bricks. The closest flood height to what is known as The Flood of 1670 was when the Severn flooded in the torrential rains of July 2007. In 1882 Worcester hosted the Worcestershire Exhibition, inspired by the Great Exhibition in London.There were sections for exhibits of fine arts (over 600 paintings), historical manuscripts and industrial items.The profit was £1,867.9s.6d. The number of visitors is recorded as 222,807. Some of the profit from the exhibition was used to build the Victoria Institute in Foregate Street, Worcester. This was opened on 1 October 1896 and now houses the city art gallery and museum. Further information about the exhibition can be found at the museum. During World War II, the city was chosen to be the seat of an evacuated government in case of mass German invasion. The War Cabinet, along with Winston Churchill and some 16.000 state workers, would have moved to Hindlip Hall (now part of the complex forming the Headquarters of West Mercia Police), 3 miles (4.8 km) north of Worcester and Parliament would have temporarily seated in Stratford-upon-Avon. The former RAF station RAF Worcester was located east of Northwick. 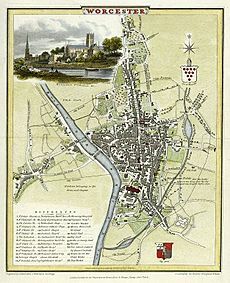 In the 1950s and 1960s large areas of the medieval centre of Worcester were demolished and rebuilt as a result of decisions by town planners. This was condemned by many such as Nikolaus Pevsner who described it as a "totally incomprehensible... act of self-mutilation". There is still a significant area of medieval Worcester remaining, but it is a small fraction of what was present before the redevelopments. Worcester enjoys a temperate climate with warm summers and mild winters generally. However, the city can experience more extreme weather and flooding is often a problem. During the winters of 2009-10 and 2010-11 the city experienced prolonged periods of sub-freezing temperatures and heavy snowfalls. In December 2010 the temperature dropped to −19.5 °C (−3.1 °F) in nearby Pershore. The River Severn and the River Teme partially froze over in Worcester during this cold snap. In contrast, Worcester recorded 36.6 °C (97.9 °F) on 2 August 1990. Between 1990 and 2003, weather data for the area was collected at Barbourne, Worcester. After the closure of this weather station, the nearest one is located at Pershore. The 2001 census recorded Worcester's population at 93,353. About 96.5% of Worcester's population was white; of which 94.2% were White British, greater than the national average. The largest religious group are Christians, who made up 77% of the city's population. People who reported having no religion or who did not state their religion made up 21% of the city's population. Other religions totaled less than 2% of the population. Ethnic minorities include people of Bangladeshi, Chinese, Indian, Pakistani, Italian and Polish origin, with the largest single minority group being British Pakistanis, numbering around 1,200, approximately 1.3% of Worcester's population. This has led to Worcester containing a small but diverse range of religious groups; as well as the commanding Worcester Cathedral (Church of England), there are also Catholic, United Reformed Church and Baptist churches, a large center for The Church of Jesus Christ of Latter-day Saints (LDS Church), an Islamic mosque and a number of smaller interest groups regarding Eastern Religions such as Buddhism and the Hare Krishnas. The most famous landmark in Worcester is its imposing Anglican Cathedral. The current building; known as Worcester Priory before the English Reformation, is officially named The Cathedral Church of Christ and the Blessed Virgin Mary. Construction begun in 1084 while its crypt dates from the 10th century. The chapter house is the only circular one in the country while the cathedral also has the distinction of having the tomb of King John. The parish church of St. Helen, located on the north side of the High Street, is mainly medieval with a west tower rebuilt in 1813. 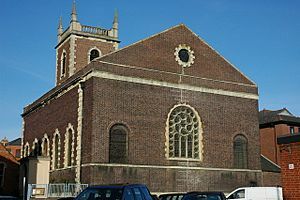 The east end, refenestration and porch o was completed by Frederick Preedy in 1857-63. There was further restoration, by Aston Webb, in 1879-80. It is a Grade II* listed building. Limited parts of Worcester's city wall still remain in situ. There are three main parks in Worcester, Cripplegate Park, Gheluvelt Park and Fort Royal Park, the latter being on one of the battles sites of the English Civil War. In addition, there is a large open area known as Pitchcroft to the North of the city centre on the east bank of the River Severn, which, apart from those days when it is being used for horse racing, is a public space. Gheluvelt Park was opened as a memorial to commemorate the Worcestershire Regiment's 2nd Battalion after their part in the Battle of Gheluvelt, during the First World War. There are also two large woodlands in the city, Perry Wood, at twelve hectares and Nunnery Wood, covering twenty-one hectares. Perry Wood is often said to be the place where Oliver Cromwell met and made a pact with the devil. Nunnery Wood is an integral part of the adjacent and popular Worcester Woods Country Park, itself next door to County Hall on the east side of the city. Several A roads pass through the city. The A449 road runs south-west to Malvern and north to Kidderminster. The A44 runs south-east to Evesham and west to Leominster and Aberystwyth and crosses Worcester Bridge. The A38 trunk road runs south to Tewkesbury and Gloucester and north-north-east to Droitwich and Birmingham. The A4103 goes west-south-west to Hereford. The A422 heads east to Alcester, branching from the A44 a mile east of the M5. The city is encompassed by a partial ring road (A4440) which is formed, rather inconsistently, by single and dual carriageways. The A4440 road provides a second road bridge across the Severn (Carrington Bridge) just west of the A4440-A38 junction. Carrington Bridge links the A38 from Worcester towards Gloucester with the A449 linking Worcester with through Malvern. Worcester has two stations, Worcester Foregate Street and Worcester Shrub Hill. Worcester Foregate Street is located in the city centre, on Foregate Street. 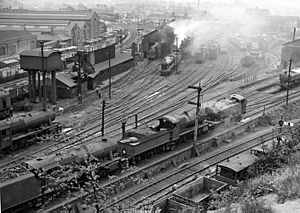 The line towards Malvern and Hereford, which is the Cotswold Line, crosses Foregate Street on an arched cast-iron bridge which was remodelled by the Great Western Railway in 1908 with decorative cast-iron exterior serving no structural purpose. Between Foregate Street and the St. John's area of the city, heading towards Malvern and Hereford, the line is elevated and travels along the Worcester viaduct which crosses over the River Severn. Worcester Shrub Hill is located around one mile from the city centre on Shrub Hill Road. 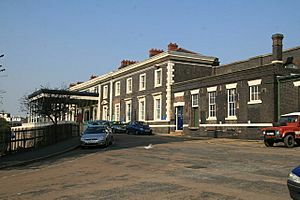 The station is part of a loop line off the Birmingham to Gloucester railway, which forms part of today's crosscountry route. 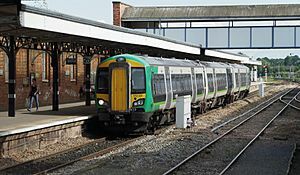 Both stations frequently serve Birmingham via Droitwich Spa, then either lines being firstly via Kidderminster and Stourbridge into Birmingham Snow Hill and Birmingham Moor Street then onwards usually to Dorridge or Whitlocks End or secondly via Bromsgrove and University and Birmingham New Street these services are run by London Midland. The Worcester Festival was established in 2003 by Chris Jaeger MBE. Held in August, the festival consists of a variety of music, theatre, cinema and workshops, as well as the already established Beer Festival, which runs as an event within the Worcester Festival. Worcester Festival ends with a spectacular free firework display on the banks of the River Severn on the Monday of the August bank holiday. The Artistic Director of the Worcester Festival is now actor, director and writer, Ben Humphrey. The Victorian-themed Christmas Fayre is a major source of tourism every December. Elton John came to the Worcestershire Cricket Ground, New Road on Saturday 9 June 2006. Status Quo came to Sixways Stadium (Worcester Warriors) on Saturday 28 July 2007. The CAMRA Worcester Beer, Cider and Perry festival takes place for three days each August and is held on Pitchcroft Race Course. This festival is the largest beer festival within the West Midlands and within the top 10 in the United Kingdom with attendances being around 14,000 people. 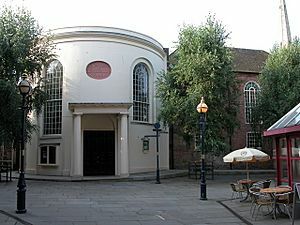 Famous 18th-century actress Sarah Siddons made her acting début here at the Theatre Royal in Angel Street. Her sister, the novelist Ann Julia Kemble Hatton, otherwise known as Ann of Swansea, was born in the city. Matilda Alice Powles, better known as Vesta Tilley, a leading male impersonator and music hall artiste was born in Worcester. The Countess of Huntingdon's Hall is a historic church now used as venue for an eclectic range of musical and comedy performances,. Recent acts have included Van Morrison, Eddie Izzard, Jack Dee, Omid Djalili and Jason Manford. Worcester Facts for Kids. Kiddle Encyclopedia.